In the main event of the evening, Matt “Meathead” Mitrione steps up on late notice to replace the injured Shane Carwin against Roy “Big Country” Nelson. Mitrione is a devastating puncher who is coming off a decision loss to Cheick Kongo, but Nelson represents perhaps the stiffest challenge of his career. Despite his doughy physique, Nelson is a devastating counter puncher with solid wrestling and great jiu-jitsu from top position. A win here would be a huge step in Mitrione’s young career, but he is going to have to find a way to deal with Nelson’s considerable bulk and superior versatility if he wants to avoid a second straight defeat. Matt “Meathead” Mitrione is a durable, powerful young Heavyweight prospect. With only six professional fights under his belt, he is still extremely raw, but his punching power can’t be denied and his wrestling shows some promise. His ground game is not much to speak of, but he is a big and strong Heavyweight with one-punch knockout power. Against Nelson he is going to have to work hard to avoid getting taken down, because he will get dominated with Nelson’s huge bulk on top of him. Even on the feet, he is going to have his hands full, because Nelson has a ton of punching power himself and is the faster and more accurate striker as well. 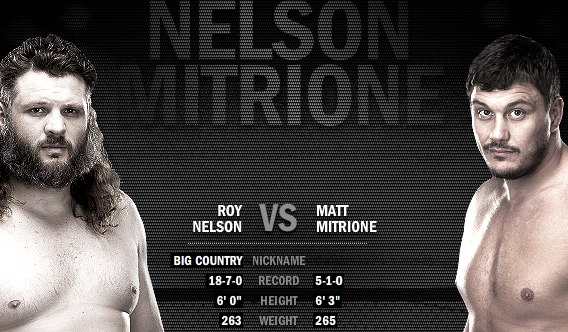 Roy “Big Country” Nelson hardly fits the profile of a typical fighter. His huge belly and seemingly flabby physique are deceiving, though, as he is actually quite light on his feet and has great hand speed. He uses his bulk very well to control opponents on the ground, and has great jiu-jitsu from top position. His best weapon, though, is his devastating counterpunching. Nelson has had great success beating opponents to the punch with powerful counter shots that leave them flattened. Against Mitrione he will be the better wrestler and the quicker, more technical striker as well. He just has to avoid overextending himself, because Mitrione definitely has the power to exploit his chin. This seems like a mismatch. Mitrione is a fine young fighter with great punching power, but I don’t see any single area where he is better than Nelson. Nelson can match him in power but is the quicker and more technical striker. Nelson is also a better wrestler and has a better ground game. I think Nelson controls this one easily with takedowns and batters Mitrione from top position for a one-sided decision win. Prediction: Roy Nelson by Unanimous Decision.